Kenyan police officers and Kenyan National Youth Servicemen search the site of a building collapse in Nairobi, Kenya, April 30, 2016. Rescue crews in the Kenyan capital, Nairobi, are searching for survivors after flooding caused a seven-story residential building to collapse, killing at least seven people and trapping an unknown number of others inside. Authorities said Saturday more than 120 people were rescued and taken to hospitals. The Red Cross says units in the building and adjacent homes were affected by the collapse Friday night. 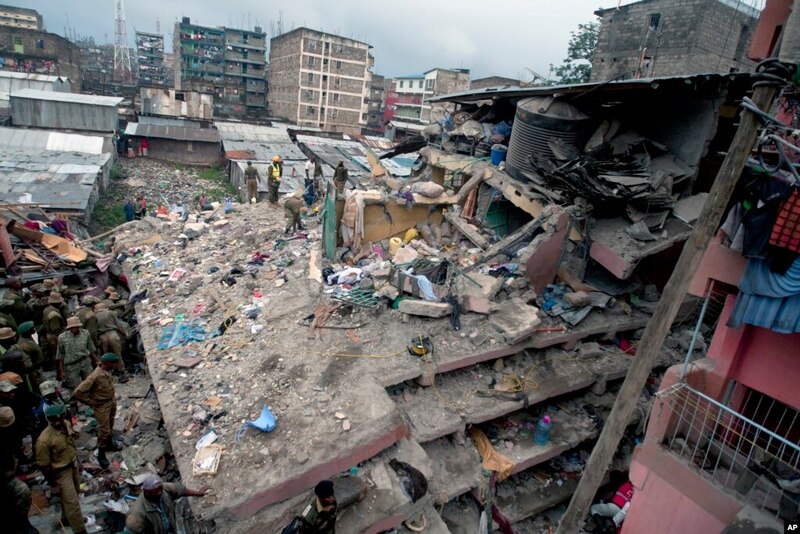 The large residential building was located in a low-income, densely populated neighborhood in Nairobi called Huruma. Heavy rains caused flooding and landslides in many areas of the city that made it difficult for rescue teams trying to reach the scene. Earlier Friday, three people in another part of the city were killed after the flooding caused a wall around a property to collapse. Kenya’s growing middle class has caused an increase in demand for housing in the city, but building materials used in Nairobi’s recent construction boom have come into question after several building collapses over the past year killed more than a dozen people. President Uhuru Kenyatta ordered an audit of every building in the country last year after eight buildings collapsed, killing at least 15 people. A report from the Architectural Society of Kenya estimates that half of the structures in Nairobi are not up to code.